Trying various approaches is a good idea, especially in difficult skin conditions such as scars. In principle, foundation should not be applied on freshly rolled skin but a day after is already OK. Applying it over bruises is also OK. Make sure that the foundation is unlikely to be contaminated – it should be rather new and preferably in a tube because tubes do not get contaminated. I have answered almost 2000 questions on this forum so we are not so strict with what is and what is not allowed, however it requires constant vigilance to prevent this forum from descending into "empty rattling" if you know what I mean. Also, I have Asperger's syndrome and this is characterized by being honest, focused and rational but sometimes, aspies are perceived as rude because we lack "social skills". BTW thank you very much for your email - I will have a look at it as soon as I have time. A 0.5 mm roller is the best option for your purpose. For the time being, buy the Tretinoin cream and a 1.5 mm dermastamp with 35 needles and stamp just your scars. Do a test patch first to see how your skin reacts. Write me back in about five months to tell me how the hyperpigmentation and the stamping goes and we may add more products to your skin care routine. That's just a tiny bruise - this can happen occasionally on thin skin. It is completely normal and nothing to worry about. Retin A contains an acidic form of vit. A.
Vit. A is oil-soluble and you can mix it with creams or oils or apply creams or oils on top of it. Yes, you can apply Infadolan on top of the A-Ret but if you are prone to acne, Infadolan is not really suitable for long term application on the face because it is too heavy. One time application right after dermarolling the face is OK. If you roll on your body, Infadolan can be applied long term without any problems. You seem to have many enlarged pores that are hyperpigmented and just a few scars. I suggest you use our 0.5 % Tretinoin cream and use for several months to diminish the pigmentation. Use it on your nose as well. "Tretinoin decreases skin pigment melanin content. It means, it improves spots and melanin related hyperpigmentation but it also means it makes skin less protected from the UV radiation (melanin is skin`s natural UV filter). The darker the skin, the more naturally protected it is. So, you have to apply a sunscreen or use Tretinoin during the winter. The more is not the better with Tretinoin. Do not apply too much. Applying every second day is sufficient. If you are young, acne free with no pigmentations or post acne spots, there is no reason to apply Tretinoin." Hollow or knife shaped needles such as diabetic lancets are totally unsuitable for microneedling. Subcision is a different and much more traumatic procedure than needling. Subcision means going horizontally underneath the scar with a thick needle and cutting the fibers under the scar. Needling means pricking the skin vertically with a very thin needle. In the study below, sweet almond oil, jojoba oil and paraffin oil were tested for penetration and moisturizing effects (occlusion). All three penetrated the outermost layer of the skin (SC= stratum corneum) and all three provided moderate occlusion (petrolatum as a control provided strong occlusion). The oils were semi-occlusive, whereas petrolatum was very occlusive. Semi occlusive substances are ideal for moisturizing. (Rosehip oil is also useful in that way). Topical application of oils and oil-based formulations is common practice in skin care for both adults and infants. Only limited knowledge however is available regarding skin penetration and occlusive potential of oils and common methods for measuring skin moisturization fall short when it comes to the moisturizing effect of oils. In this study we used in vivo confocal Raman microspectroscopy to test the efficacy of paraffin oil (mineral oil) and two vegetable oils in terms of skin penetration and occlusion. Petrolatum was used as a positive control. The products were applied topically on the forearms of nine volunteers and seven infants and Raman spectra were acquired before and at 30 and 90 min following application. Depth concentration profiles for lipid and water were calculated from the Raman spectra. Skin occlusion was assessed from the amount of stratum corneum (SC) swelling measured from the water concentration profiles. The paraffin oil and the vegetable oils penetrate the top layers of the SC with similar concentration profiles, a result that was confirmed both for adult and infant skin. The three oils tested demonstrated modest SC swelling (10–20%) compared to moderate swelling (40–60%) for petrolatum. These data indicate that there is no statistical difference between the paraffin oil and vegetable oils in terms of skin penetration and skin occlusion. The results for petrolatum show that in vivo confocal Raman microspectroscopy is sensitive and specific enough to measure both lipid uptake and skin occlusion events following topical application. The reason is both one of physics and one of statistics (mathematics). The roller needles will not go through the hairs because the hair, being cyllindrical in shape and not firmly fastened to the substrate (the skin), will move out of the way when the needle hits it. And even if the needle would piece the hair's keratin, the difference between penetrating the hair and the skin (the skin is tough) is very small so even if some of the needles would penetrate it sometimes, it would make very marginal difference. The top layer of the skin is made of Keratin and the hair is made of the same substance, so all in all, since steel is harder than Keratin, there is no significant extra blunting to be expected. Thank you, cesamaddict. I wanted to answer the same - that the scars are very similar to yours..
A regular 2 mm dermaroller and a 2 mm dermastamp with 35 needles and the suction pump. Do not buy the dermastamps with the 80 needles if you have serious scars. The more the needles, the harder it is to penetrate the skin (the so-called "fakir effect"). The less needles, the deeper and easier they penetrate and in your case, you really need to go deep. Also, your skin seems to be thick and tough. If you have lots of scars, it is wiser to treat just one cheek (but thoroughly and densely). When it heals, treat the other cheek. Roll over the scars but avoid the areas that have lots of pores and no scars, such as in your case right next to the nose part of the cheek. Pores can sometimes react unpredictably to such long needles and you have no scars in that area anyway. You should also try the Tretinoin cream (we sell it) in the same way as mentioned in the link cesamadict provided above. Use the suction pump especially on the large indentations in the middle of your left and right cheek. If you do not have a high threshold for pain, you may need a numbing cream. Such long needles are painful but we have customers rolling with 2 mm needles without using a numbing cream. It is individual. I think your scars will improve if you have patience and perseverance. Please let us know about your results (or lack of them). Thank you very much for telling everyone about your experience! Dermarolling / Microneedling / Re: Just a Dermastamp on Stretch Marks? A combination of a dermaroller and a dermastamp (or the single needles) is best but you can go without a dermaroller too. You can stamp and single needle the same stretchmarks during the same session but do not do all your stretch marks in one session if you have very many. Treat just a few whenever you have time but stamp and needle them thoroughly and densely. However, each stretch mark should be treated only about once a month so every time you needle/stamp during a month, do it on different stretch marks. 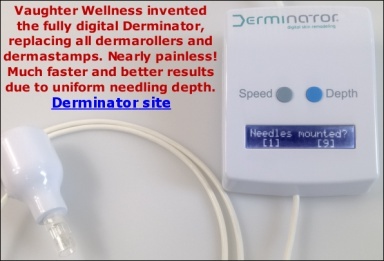 A dermaroller does not penetrate the full length of the needles. A dermastamp more or less does. A 0.2 mm dermaroller will however penetrate into the epidermis. Yes, crusts/scabs are completely normal. Never remove them forcefully. They should fall off naturally when the skin under them has healed. Keep the area moisturized. Before I answer - you forgot to attach the pictures!